When a tumor is ruptured, metabolic byproducts are released into the systemic circulation and can cause harm. Tumor lysis syndrome (TLS) occurs when a tumor is ruptured. 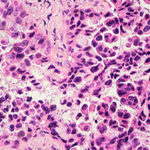 When ruptured, the tumor releases a large number of electrolytes, including intracellular potassium, phosphate, and nucleic acid metabolites, all of which may enter systemic circulation and cause a number of life-threatening conditions including cardiac arrhythmia, seizure, and acute renal failure. Tumors are typically ruptured by cytotoxic chemotherapy and rarely rupture spontaneously. The case study follows a 55-year-old female smoker with a history of obstructive pulmonary disease and diabetes. The patient presented with worsening dyspnea and respiratory distress, including wheezing and decreased breath sounds in the left upper lung field. Her vital signs were consistent with tachypnea and tachycardia. Chest radiography revealed left upper lung airspace disease. The patient’s condition was diagnosed as pneumonia with acute respiratory failure. Abdominal ultrasonography revealed an enlarged liver with multiple masses. Once the patient’s condition stabilized, chest and abdomen computed tomography examinations were performed. The patient had a 7-cm mass in the left upper lung lobe as well as widespread bilateral mediastinal and left hilar, axillary, and supraclavicular lymphadenopathy and multiple liver metastases. Histopathologic examination of a liver biopsy indicated high-grade small cell neuroendocrine cancer. Magnetic resonance imagining of the brain revealed no abnormal findings. 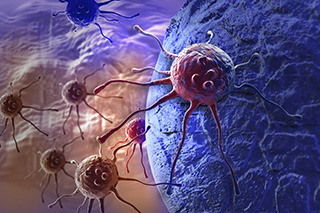 Extensive-stage small cell lung cancer was subsequently diagnosed. Four days following hospital admittance, oliguria was detected along with increasing serum levels of creatinine, potassium, phosphorous, and uric acid. The diagnosis of TLS was based on the characteristic electrolyte abnormalities. The patient’s renal function continued to deteriorate even after aggressive treatment with fluid resuscitation, phosphate binders, allopurinol, and rasburicase. Daily hemolysis following the first cycle of palliative chemotherapy with cisplatin and etoposide was also performed, but the patient’s renal recovery was poor and she eventually became dependent on dialysis.